Angela Merkel and Emmanuel Macron had been due to unveil their joint vision for the future of the currency on March 22. 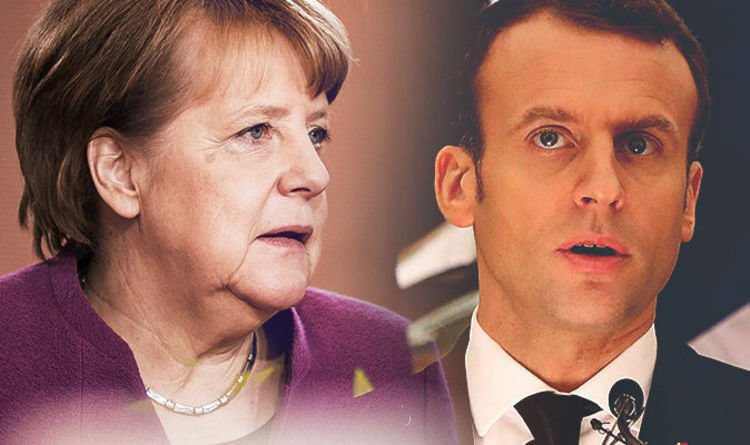 The ambitious reforms, which both leaders have expressed a strong desire to see become a reality, including ensuring Eurozone unity and the future sustainability, issues which have plagued the single currency for years. But as European finance bosses meet in Brussels today, some officials expressed their disbelief at Berlin and Paris for not even managing to pen a joint letter to promote their plans. Politico has reported Latvian commissioner Valdis Dombrovskis as saying he “wasn’t surprised” by the reaction from the two EU powerhouses. But he insisted EU finance officials would push on regardless. And according to EU officials, any future announcement for Eurozone reform has now been postponed indefinitely. An anonymous EU official told Der Spiegel: "The thing has been cancelled. "There’s simply nothing that could be announced." The next EU leaders’ summit is not scheduled to take place until the end of June. EU member states have long been pushing for changes to the single currency. Richer nations in the north of the bloc have advocated for tighter monetary conditions to encourage further economic growth and maintain their trade surpluses. However poorer member states in the south are pushing for cheaper borrowing as they struggle under heavy debt. In order for major changes to the Euro to become a reality, the EU will need both France and Germany on board. Angela Merkel has faced months of political turmoil in Germany after a poor election performance which saw her lose ground to the far-right Alternative for Germany (AfD). After months of talks with the centre-left Social Democrats, she has finally formed a government and managed to cling on to power, but any Eurozone reform plans will now need the agreement of both coalition parties. In addition, she is likely to face fierce opposition from the AfD which is ardently against further integration between EU member states. Meanwhile, in France, Mr Macron faces his own problems from the far-right, with his ambitious plans for EU reform, including changes to the Eurozone, likely to be opposed by the National Front.